The undisputed king of American horror films. 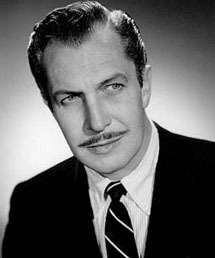 Vincent Price was born in St. Louis on May 27, 1911, the son of a candy company owner. After studying art history and attending Yale University and the University of Vienna, young Vincent worked on the stage in both London and Broadway, including Victoria Regina. Price worked steadfastly on a myriad of films from the late '30s through the early '50s, among them 1939's The Private Lives of Elizabeth and Essex and 1946's Leave Her to Heaven with Gene Tierney. He played Nicholas Van Ryn in Dragonwyck (also '46) again opposite Tierney, a gothic picture in the Rebecca mold directed by Joseph L. Mankiewicz. But in 1953, Price starred as the disfigured Prof. Henry Jarrod in the classic House of Wax - and thus began Vincent's journey of unparalleled horror performances. The rest of the decade saw Price re-inventing himself - and his career in the genre - with The Fly (1958), The Tingler (1959) and The House on Haunted Hill (1959). Though his '50s body of work in terror might have exhausted some, it was all foreplay for Price. He was just getting started. The early '60s saw a gamut of Roger Corman Poe adaptations for AIP, including the The House of Usher, The Pit and the Pendulum, The Masque of the Red Death and The Tomb of Ligeia. Think he was finished by the 1970s? Far from it. Price delivered what many consider some of his most delightful performances, be they in 1971's The Abominable Dr. Phibes, Madhouse (1974) or the piece of art Theatre of Blood (1973). Alternately revered and reviled for his 'theatrical' acting style, Price's well-known flourishes are often simply over-exaggerations on the part of the critics. Watching Price is like the smoothest of possible roller coaster rides; once you strap yourself in and relax, you know you are in for effortless entertainment. Price continued to work throughout the '80s and early '90s prior to his death in 1993. Clearly, there will never be another Vincent Price.